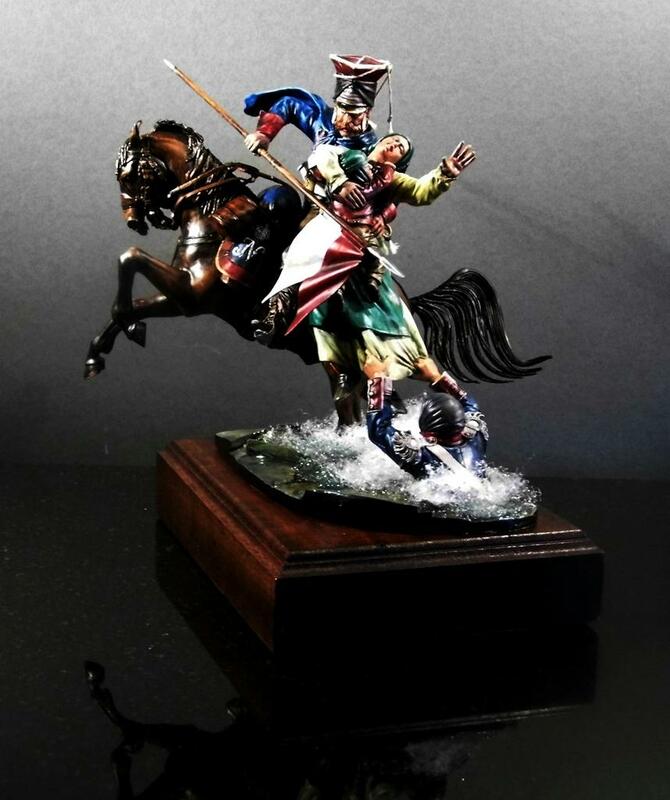 The Battle of Berezina took place November 26-29, 1812, between the Grande Armée of Napoleon, retreating after his failed invasion of Russia, and the Russian armies under Mikhail Kutuzov, Peter Wittgenstein and Admiral Pavel Chichagov. 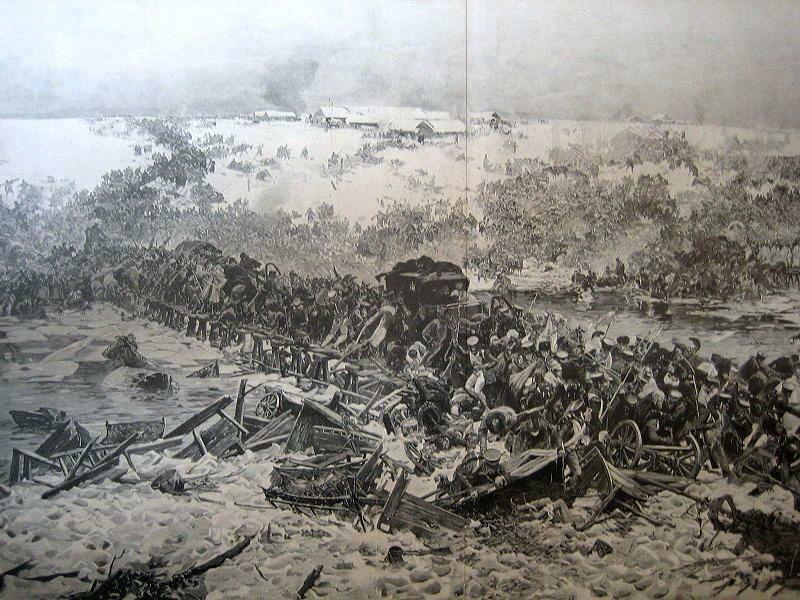 The French army, in impossible conditions, managed to construct a single-span bridge on the Berezina (near Borisov, Belarus), and to retreat across the river strategically intact. The battle ended uncertainly. The French suffered losses upwards of 25,000 combatants and 20,000 camp followers and stragglers. The Russian losses were estimated at upwards of 20,000 combatants. 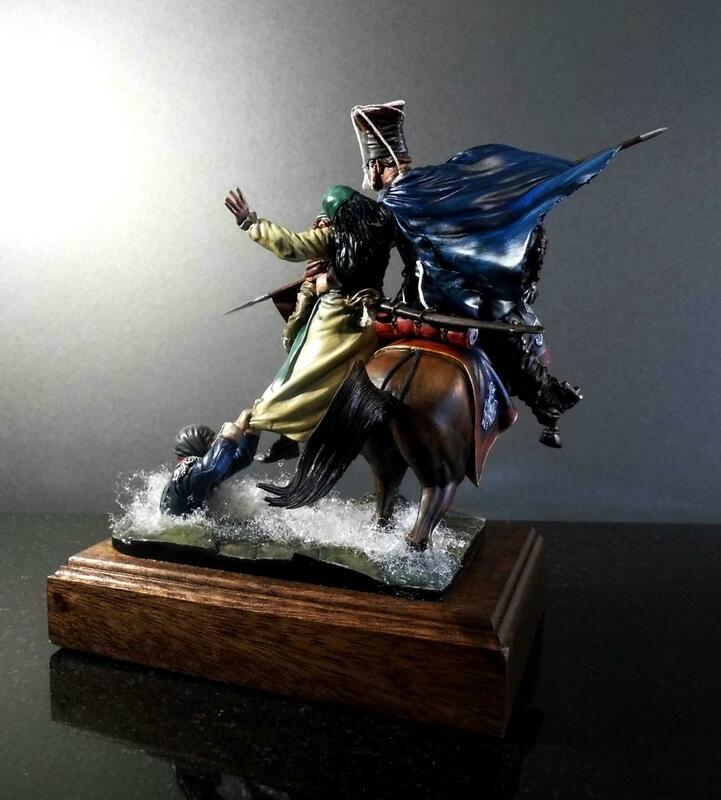 This 90mm resin vignette, sculpted by Alan Ball, depicts a scene from the river crossing at Berezina. 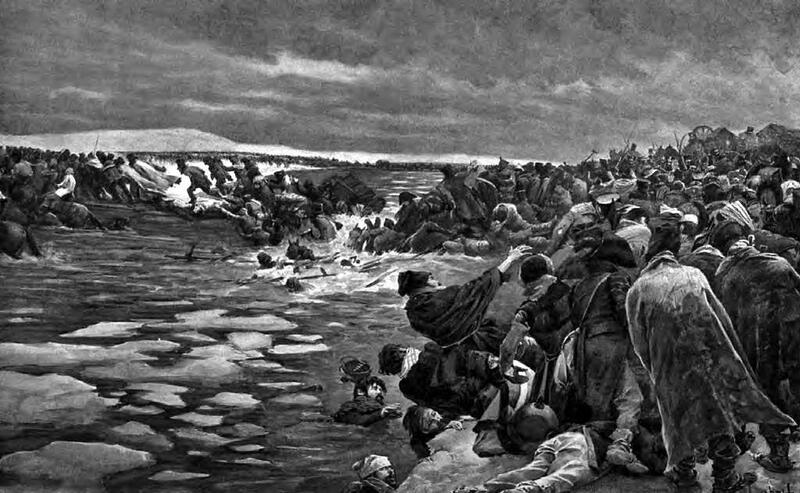 Specifically, a Lancer of the V (Polish) Corps has rescued a woman and child from the freezing waters, while another Lancer, unhorsed and drowning, clings desperately to the woman’s skirts. 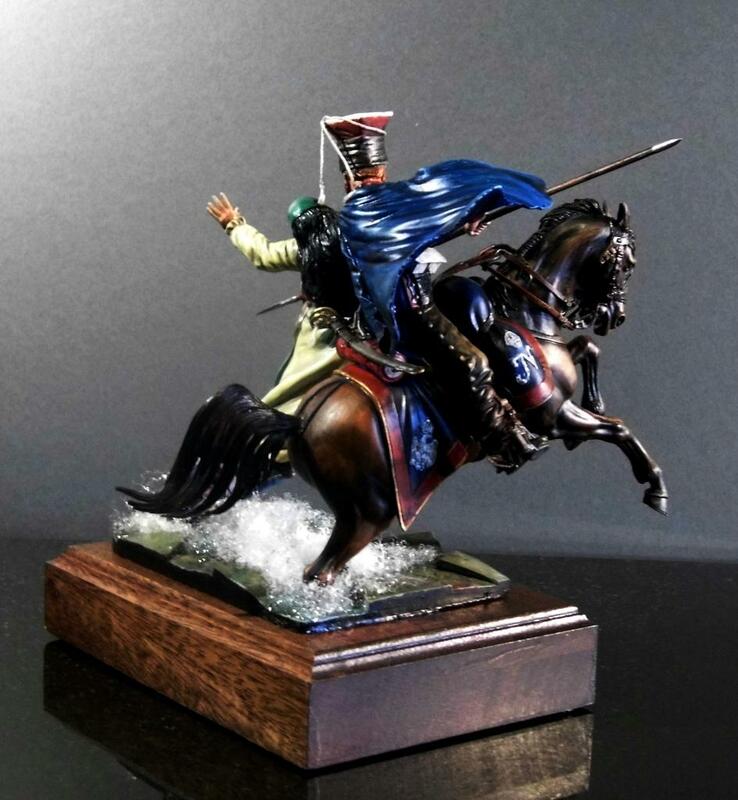 The mounted Lancer warns off the drowning man, for fear of being dragged into the icy river. It’s amazing how solitary vignettes are able to communicate the pathos of an entire people. Well done, Rob. Yes, unimaginable suffering, with upwards of 60,000 dead, – French, Russian, allies and stragglers. Fantastic work, Rob. Lovely subtle brushwork and there’s a real sense of action and emotional engagement. Took me by surprise that you finished this so quickly. Thanks David, and thanks for looking in on the WiP thread. Should add that the piece has only recently had a final coat of Artists Matt Varnish, and will settle down over the next few weeks to a more subtle finish. Vividly expressed, Rob…very nice work. Excellent work Rob, I really like how this vignette tells a tragic human story. Well done indeed. By the way, the vignette is now on a wooden base. Certainly tells a story, well done!! Beautiful final result Rob (@robbo) ! Thanks Dolf, and thanks for WiP comments. Amazing work Rob! Very well done. I don’t normally follow figures since is not one of the mediums I work with, but this really had my attention from the beginning to the end. Cheers, James. I know what you mean; it’s a bit of a niche market, but some figures do draw your attention for their dramatic quality, and this is a very nicely cast group. Thanks, Martin. 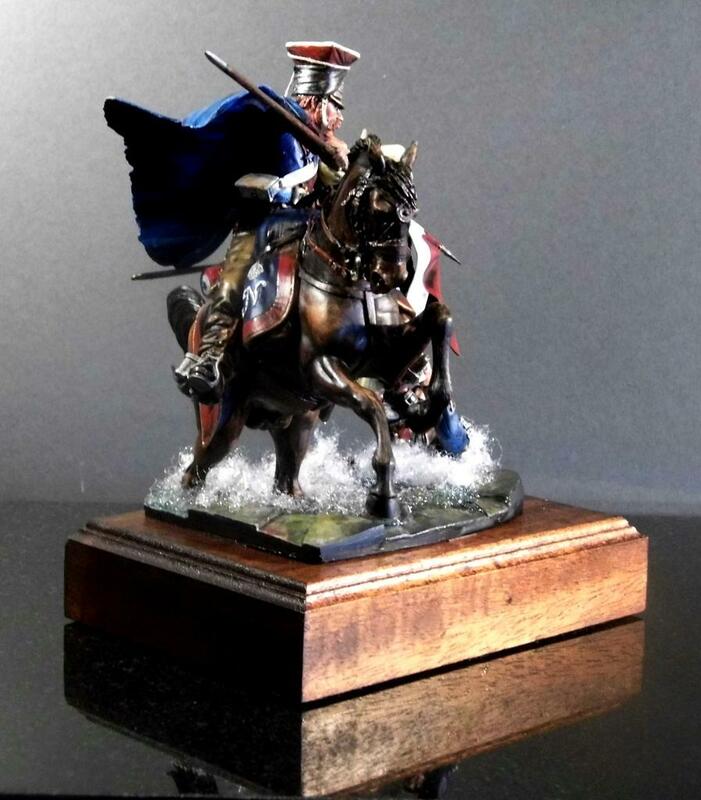 Anyone interested in resin/fibre details for water effect please have a look at the WiP thread in Figures Group. 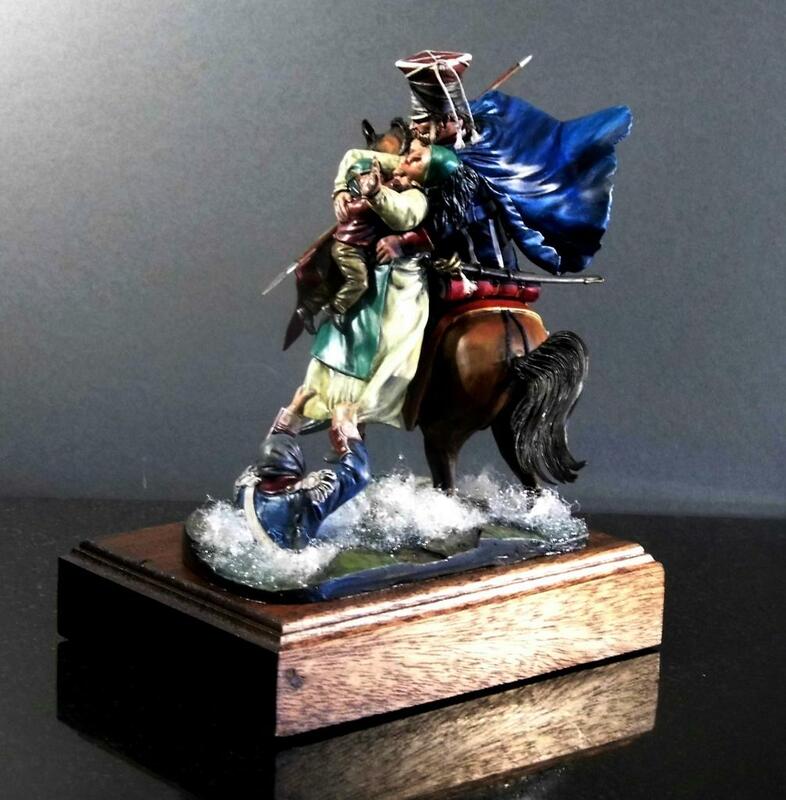 Rob, it’s a wonderful vignette, full of life since everything in it has that still motion effect…the horse, the horseman, the river and the drowning trooper, even the lady has that classical pose. Just wonderful! That’s really impressive. Lots of real dynamism in the entire piece. You can feel the cold water, the terror of the unhorsed soldier, the fear of the woman and her rescuer that they will be pulled down. Just really stunning all the way around, Rob. Comment appreciated, Tom. Thanks for looking in. This is a work of art! I know very little about the history behind this piece but even to the eye of someone who lacks the historical context, this tells a story and really is a perfect snapshot of a moment in the past. Well done! It was a monumental time in European history, and fortunately there are several sculptors who have taken an interest in the era. I would say, though, that the Berezina sculpture is one of the most dramatic I’ve seen. Cheers for the comment, Matthew. I think I shall go watch a documentary. I have always overlooked this part of history and I honestly have no clue why haha! I’m late to the party but just want to add my accolades! A beautiful piece of art. Thanks, Greg. Your comment is very welcome. Wonderful result, Rob it looks superb, a great sense of motion,drama and tragedy! A history lesson too, I would like to say that I had forgotten about the battle of Berezina ( 65,000 dead) , but I regret to say that, like the figures group, I didn’t even know of its existence. In the early 19th century most of Europe was engaged in empiric wars of attrition, hundreds and hundreds of thousands killed, and with great displacement of peoples. 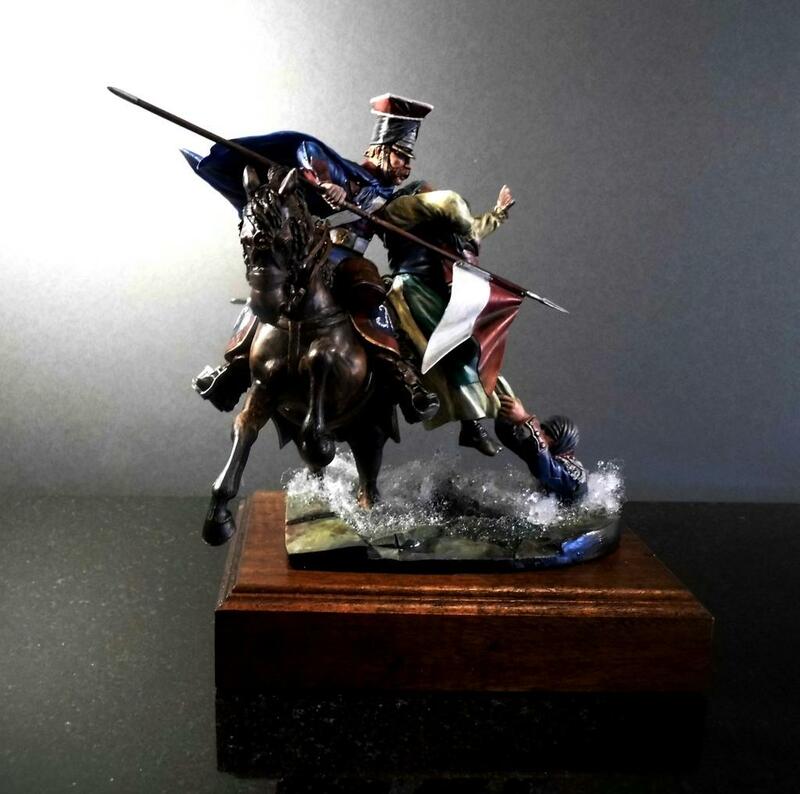 It’s sometimes said variously that the First World War was the ‘last war of the nineteenth century,’ or ‘the last war of empire.’ We know a great deal about WW1, but at the other end of the spectrum the wars of the Napoleonic period seem to have slipped out of consciousness. Here, there were three invasions by Napoleon’s armies. All were defeated, so Portugal was able to remain a souverain & independent country. 1st invasion, led by Junot, the French Army entered Portugal on November 20, 1807. No resistance was offered, so they ended up in Lisbon, the capital, on November 30. The Portuguese royal family fled to Brazil the day before. A year later, a British military expedition, led by Arthur Wellesley (later Duc of Wellington) disembarked in Portugal, and together, the Anglo-Portuguese Army defeated the French in two battles. The French were forced to sign an Armistice and withdraw, but brought all they had looted during their stay here. On March 1809, the 2nd invasion, led by Marshal Soult, entering from the North, arrived at Porto on the 24th. Again led by the Duc of Wellington, the Anglo-Saxon force won a battle in the city of Porto on May 29, forcing the French to withdraw to Galicia. On August 1810, the 3rd invasion, led by Marshal Massena, entering again from the North, and after defeating the Anglo-Portuguese forces in the North, kept marching towards Lisbon. But once again led by the Duc of Wellington, the Anglo-Portuguese forces won a battle (that became famous in our History) in Buçaco, but the French moved quickly, outflanking the Anglo-Portuguese forces and kept advancing towards Lisbon. The Anglo-Portuguese alliance also moved fast and arrived first at Torres Vedras (really not far from where I live now btw), where with the help of the population they created a defensive line, which became known as the “Line of Torres Vedras”, where they waited for the French Army and totally defeated them, this time for good, as they never attempted to invade again. Some may have forgotten the Napoleon invasions, but here we didn’t, it’s an important part of our History. Same as in Russia. Just as a side note, Portugal and Great-Britain have the oldest military Alliance in the world, it’s called the Treaty of Windsor, and that is one of the reasons why the Brits came help us during those French invasions 😉 The other of course is the long time rivalry between Britain and France, particularly in that time period. A rich period of conflict and alliances. History lesson appreciated! 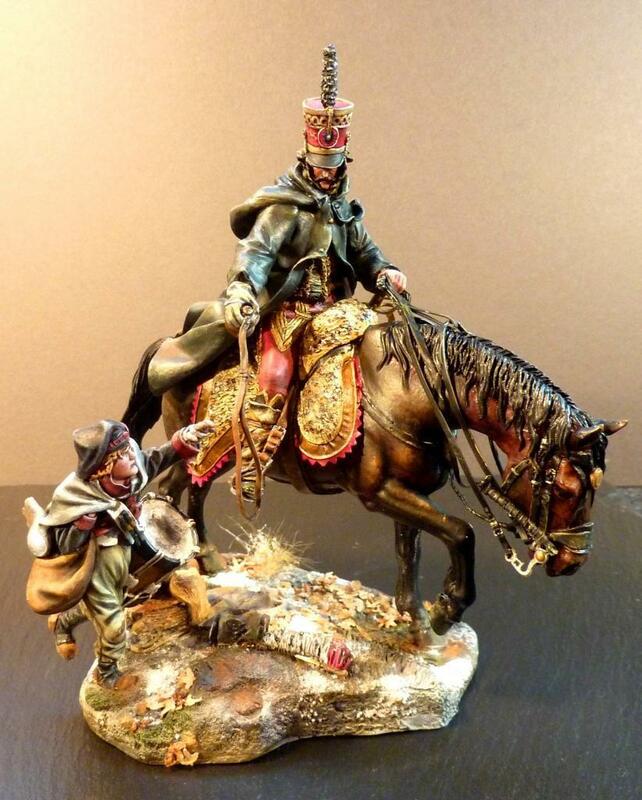 But what a piece – I don’t recall a more dramatic set of figures, Beautiful! 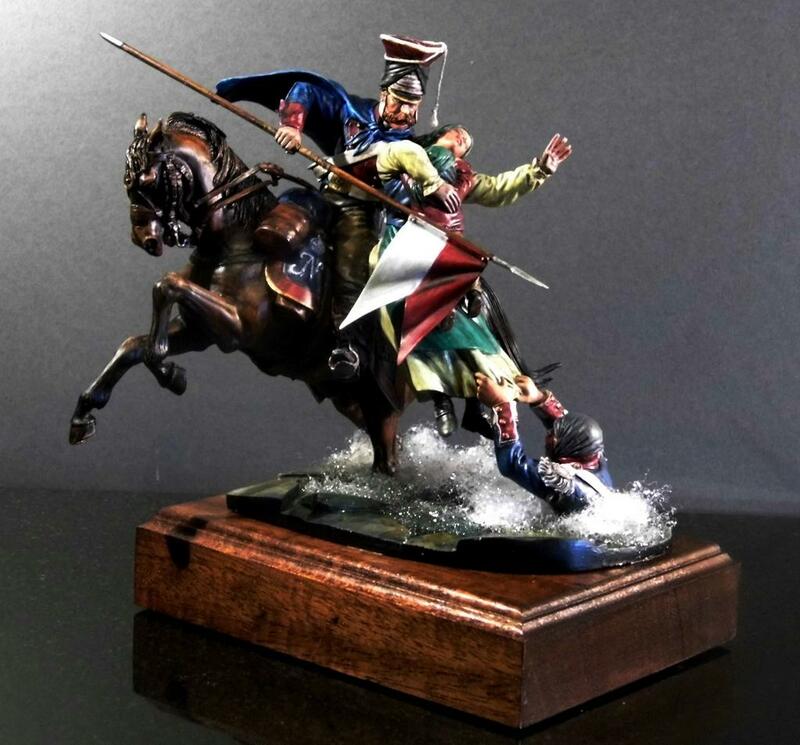 I think it’s not only the figures, as such, but the dynamic angles, for instance, with the horse seemingly charging out of the very vignette itself.